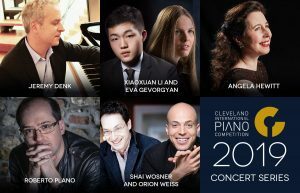 Cleveland International Piano Competition (CIPC) is thrilled to announce our 2019 Concert Series! The brilliant pianists in this lineup will leave the audience awestruck and the level of talent, passion, and virtuosity displayed will be anything but ordinary. Rest assured, this is one concert series you do not want to miss! Advance tickets for the series are AVAILABLE NOW for CIPC Community Members! Call 216-707-5397 to secure yours today! General sale tickets will be available in the coming months. For CIPC concert patrons, 2017 was a year to remember. Beginning with a sublime performance by renowned pianist Marc-André Hamelin, carrying on with Nikita Mndoyants – who reminded all in attendance of the mastery he displayed at the 2016 CIPC – and ending with a once-in-a-lifetime, sold-out performance by Martha Argerich and Sergei Babayan at Severance Hall, the series offered up many moments of sheer bliss for every music lover. Thanks to the generosity of Ms. Argerich and Mr. Babayan, we can share one of those moments with our readers. Please click HERE to enjoy an encore the duo performed at Severance Hall, the Waltz from Rachmaninoff’s Suite No. 2 for Two Pianos, Op. 17. Cleveland Classical’s Daniel Hathaway called Marc-André Hamelin’s performance “a revelation.” Mark Satola, writing for the Plain Dealer, praised the “flawless technique” demonstrated by Nikita Mndoyants. And Donald Rosenberg, writing for Pianist magazine wrote that when Ms. Argerich stepped onstage with Mr. Babayan at her side “the audience welcomed her as a conquering hero.” Each of these nights will surely be remembered and cherished by all in attendance. CIPC extends its deepest thanks to the artists who shared their glorious gifts on these three evenings. We are all made richer for the experience. When Nikita Mndoyants won first prize at the Cleveland International Piano Competition last year he was awarded more than a cash prize. He also received a Carnegie Hall debut, a compact disc recording on the Steinway & Sons label, and dozens of concert engagements in the U.S. and abroad. Earlier this year he began fulfilling those engagements, beginning with two concerts in Europe – one in the Salle Cortot in Paris, and another at the Bozar Centre for Fine Arts in Brussels. These two concerts were part of the Steinway Prizewinner Concert Network, a collaboration of piano competitions, concert organizers, festivals, and radio stations that introduce select young pianists to international audiences. CIPC was invited to be a part of this prestigious network last year. Mr. Mndoyants will perform in Weill Recital Hall at Carnegie Hall in June, and then follow with summer performances at the International Keyboard Institute and Festival (New York City), Brevard Music Festival (North Carolina), and the Chautauqua Institution (New York). He will launch the U.S. component of his 2017/18 season with a performance with the Escher String Quartet for the Tuesday Musical Association (Akron, Ohio), continuing with multiple visits to the U.S. that extend into the spring. 3:00 pm on Sunday, April 30 at the Maltz Performing Arts Center. He will preview parts of his solo Carnegie Hall program and partner with members of The Cleveland Orchestra for Schumann’s stunning Quintet in E-flat Major, Op. 44. While in Cleveland Mr. Mndoyants will visit the schools participating in the PianoKids program for a short performance and a Q&A session with the children. He also will teach master classes in the piano department of Cleveland State University’s School of Music and the Cleveland Institute of Music. CIPC extends its thanks to Mr. Mndoyants for sharing his gifts with the young people of our community and to Steinway Piano Gallery Cleveland for providing the piano for his performances in the schools. Marc-André Hamelin is ranked among the elite of world pianists for his unrivaled blend of musicianship and virtuosity in the great works of the established repertoire, as well as his exploration of music from the 19th and 20th centuries. Enjoy his golden artistry in a stunning program of works by Haydn, Beethoven, Scriabin, Chopin, and Feinburg. The concert will be preceded by CIPC Twilight, an exclusive, pre-concert dinner experience featuring “Art and Artifacts of Beethoven’s World,” a presentation by Dale Hilton, Director of Teaching and Learning at the Cleveland Museum of Art. Reservations and additional ticket required. Guest artists from China, France, Russia, Canada, Israel, and Palestine – as well as the entire roster of Apollo’s Fire Baroque Orchestra – provided inspiration, joy, and amazing artistry throughout the year as CIPC presented the 2014 Concert Series. The Crescendo gala, held in the Ames Family Atrium of the Cleveland Museum of Art after the third concert, provided a wonderful opportunity for old friends to catch up and new friends to meet. 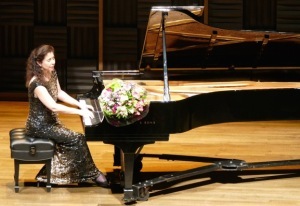 Canadian pianist Angela Hewitt electrified the audience at CIPC’s final concert of the year on Saturday, November 15. The full house in Gartner Auditorium at the Cleveland Museum of Art heard Ms. Hewitt bring her incredible artistry to a wide ranging program that began with Bach’s Partita No. 5 in G Major, and concluded with Liszt’s mesmerizing “Dante” Sonata. Truly a memorable way to end a full year of wonderful music. CIPC will present one of the best concerts of the year on August 23, as all four medalists from the 2013 Competition take the stage together, along with Apollo’s Fire Baroque Orchestra, in what can only be described as a musical extravaganza. Jeannette Sorrell will conduct. What if we said you could see all four medalists from the 2013 Competition in one spectacular concert? And that Apollo’s Fire would be part of the program? Interested? Read on! Stanislav Khristenko, Arseny Tarasevich-Nikolaev, François Dumont, and Jiayan Sun, who last stood together in Severance Hall almost a year ago, will return to Cleveland for one remarkable performance on Saturday, August 23, 4:00 pm in Gartner Auditorium at the Cleveland Museum of Art. It is the third concert of the CIPC 2014 Concert Series.